So you've snowfoamed, you've power washed, and washed your car with a two bucket method. Its clean and ready to go isn't it? In order to get the best finish, you ultimately need perfectly clean paint. The washing process so far, only takes care of the surface dirt. The stuff that washing alone can not deal with needs taking care of next. Tar, iron fall out, tree sap and other nasties, cling to your paint and rob you of the best finishes. The next time you wash your car, rub your hand slowly over the paint work. Is it bobbly, and grabby? Or glass like and smooth? Best for a really deep clean. This should only be done a few times a year, claying (and particularly with some aggresive clays) can actually do more harm than good if you do it way too often, or with the wrong technique, and in the wrong way it can cause permanent damage to your paint. Id always suggest a 'fine grade' clay if its your first time in doing this - as this can cause the least damage. This can be found on the regular car web sites, and of course eBay very easily and cheaply indeed. Most people get a complete pack, as it includes all the necessary bits you need - Clay, Lubrication, cleaning cloth and polish to protect after, you can however buy the bits separately again at your nearest web store or Halfords. Claying is very good at removing tar, tree sap, bird lime, dead bugs and of course - Ingrained dirt in your paint. A few tips when using clay - whatever size bar you get - chop it into 2 or 3 equal sized lumps, and put the other two into a clean box. There is nothing worse than starting the task of claying, and dropping your bar of clay onto the floor! It happens!!! The idea is to keep your clay as clean as possible from dirt and particles, so dropping it on the floor means instantly that piece is useless, and has to go into the bin. If the clay is getting hard too quickly, keep spares close at hand in a cup of warm / hot water to keep it supple. Never skimp on using the lube either, the clay should never 'stick' to your paint, but always glide over the surface. Its also always best to work in an 'up/down' motion, as apposed to 'round and round' with clay too - it helps reduce paint marring that can occur from using clay. You should be able to both see, and feel the difference that clay has made to your paint, it should be shinier and smoother to touch..
Best for - a quick way to remove most contamination every 6 weeks or so. The products used again are quite harsh, so shouldn't be used every time you clean the car. There are a few Iron removers on the market - Korrosol, Iron X, Auto Finesse Iron Out and Autobrite's Purple Rain are four of the most popular. Valet Pro have recently brought out 'Dragons Breath' as an alternative, and that is getting great reviews although Ive not used it yet. These can be used on wheels and bodywork, and if you've never used one before, you will be amazed at what they do!! Fallout Removers have a very nasty odour due to the chemical content within them, and are also very Acid / Alkaline based to help with cleaning power. as such, Id highly recommend the use gloves, and standing well back when you use them. Iron Fallout is caused by the metal brake discs getting so hot under braking, that tiny metal fragments come off and embed themselves in your wheels and paintwork. 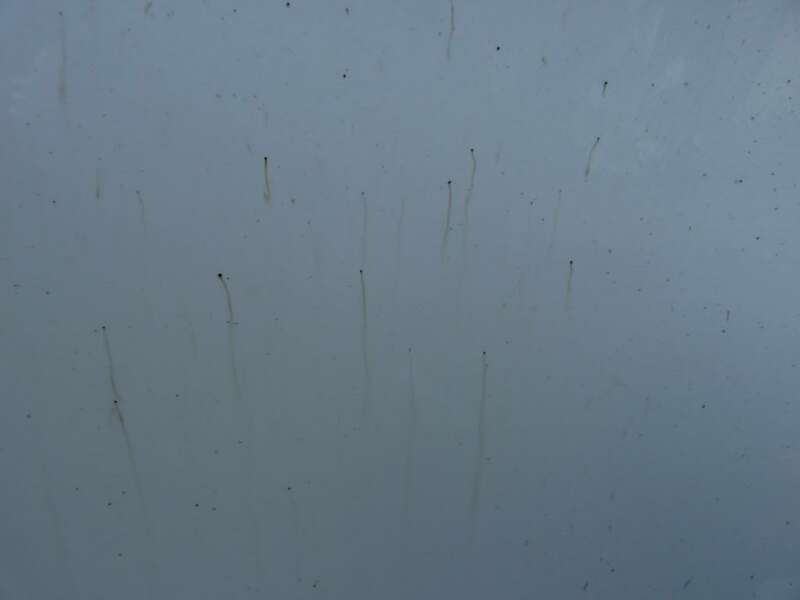 If this is not removed, over time it can cause water damage to get into your paint lacquer as the rust eats away at it.. 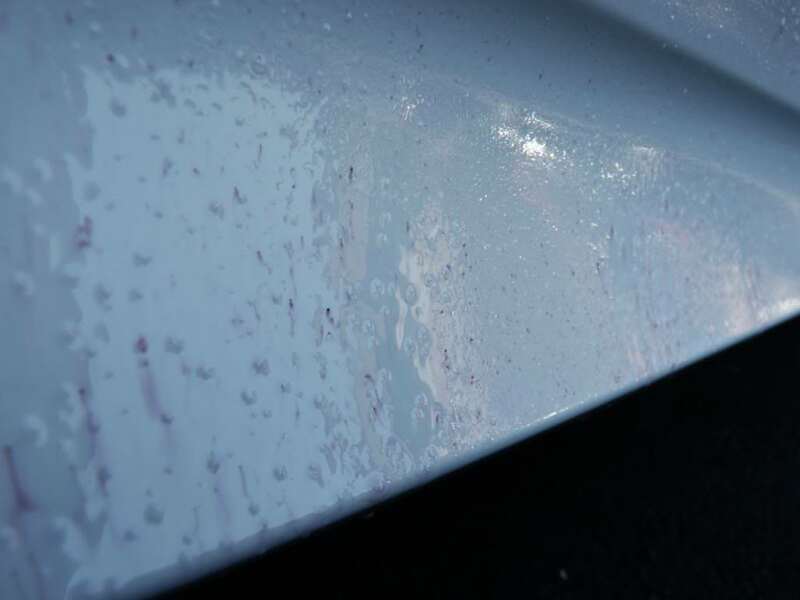 When you feel your paintwork, its usually the 'bobbly' texture that this is - it is also visible on lighter colour cars as yellow or orange specs, particularly on white cars. If you look at the top photo of our white car, you can see them as orange spots. If you live near Railway lines, this is also a way of getting fallout on your car. Dont think that new cars are immune to fallout either - many cars travel to the ports on train lines, and are often covered in fallout without ever being driven!! You do this process once you have finished washing and rinsing the car, so the paintwork and wheels should still be damp, but not soaking wet. They usually smell shocking too!!! All the purple reactions, also referred too as 'bleeding' - is the fallout remover desolving the metal fallout on contact. This usually happens inside 5 minutes. Even a new car (the picture of the Purple Rain is of a 2 week old car) had examples of iron on his wheels!! Its important to never let the products dry onto your paint though, as it can mark and stain it, so as soon as you are happy with timescale, wipe it clean gently with a microfibre, and stand back and be amazed!!! Removing tar spots is also done in a similar fashion. Autosmart Tardis is just about THE go to product for tar spot removal. Sure, there are a few rival products on the market, but this is as cheap as them, and performs 5 times as good as anything else out their!! iIf you have a white car - this stuff is a must have!! Spray on - and watch it do its stuff!! Again, dont let it dry on, and keep it away from black or grey plastic trim. Wipe it clean after about 5 minutes, but be prepared to be amazed!!! I usually give the car a quick wash again (usually with snowfoam and a wash mitt) around the areas I have just cleaned (the whole car in the case of claying) - to make sure that all of the products have been removed. The car is then dried using fluffy drying towels, and you are now ready to start the polishing process.. Brilliant. Are you not putting yourself out a job here? can i add to clay, Would always recommend Bilt Hamber Clay as uses water for lube. That way you can keep it in a bowl of warm water, makes it a lot more easy to use. Ant wrote: can i add to clay, Would always recommend Bilt Hamber Clay as uses water for lube. That way you can keep it in a bowl of warm water, makes it a lot more easy to use. RichCranney wrote: Brilliant. Are you not putting yourself out a job here? Maybe - but I'm happy to put myself out there to help other people. I was doing this anyway but with a million different posts for people, this just pulls it all together with pictures! Excellent writeup. I have the same red as in the pics what do you recommend as a sealant / polish? The car had dealer's seal and protect applied when I bought it 10 months ago which disappeared about 8 months ago ( I got it for virtually nothing and a load of BMW products)? So you just need the Clay & water ( no lube)? As i was just going to ask can you make your own lube at home? As i almost ran out when i did my car last time. I'd only use water alone as a lube with The Bilt Hamber clays, otherwise a lube is essential. E81Mark wrote: Excellent writeup. I have the same red as in the pics what do you recommend as a sealant / polish? The car had dealer's seal and protect applied when I bought it 10 months ago which disappeared about 8 months ago ( I got it for virtually nothing and a load of BMW products)? Thanks for the excellent write up. I tried claying for the first time recently and it works really well. I did mar the paint more than I'd have liked in places but it got less as I got the hang of it. It also took me a while to get the most out of using the Iron Out and Tardis. I especially like the tip on keeping the clay in some warm water. Keeping it soft and pliable wasn't always easy so I'll give this a try next time. "Time to get old painless out of the bag..."
BMW F34 335D xDrive "Lucy" - Shiny. ajwhitlock wrote: Thanks for the excellent write up. I tried claying for the first time recently and it works really well. I did mar the paint more than I'd have liked in places but it got less as I got the hang of it. It also took me a while to get the most out of using the Iron Out and Tardis. I especially like the tip on keeping the clay in some warm water. Keeping it soft and pliable wasn't always easy so I'll give this a try next time. Doh! Thank you. Fixed now!